Treat Them To An English Inn Valentine's Day Getaway! « Ring In 2018 at English Inn With Our New Year’s Eve Dinner Special! This lodging special is our premiere dinner and overnight package. It includes your choice of overnight accommodations in one of our finest rooms, a champagne dinner for two, breakfast, and a commemorative lithograph of your stay with us! All for just $325! What do we mean when we say “one of our finest rooms?” – take a look! Windsor Room: This was the master bedroom for Medovue Estate’s original owners and shows it with a rose marble fireplace, four-poster bed, and expansive views of the front lawn. Somerset Room: These spacious quarters contain a large bath, whirlpool tub, and a four-poster bed that is original to the home. Stunning views of the rolling countryside to the west and beautiful sunsets complete the picture. Ivy Cottage: This plush and comfortable cottage features a Jacuzzi tub for two, fireplace, and a deck with views of the Grand River and meadows. The Croquet Cottages: These newly constructed cottages overlook the estate, croquet court, and the Grand River. Each cottage offers Jacuzzi air tubs, gas fireplaces, king size beds, and incredible views. All of English Inn’s rooms also include cable television, luxurious linens, and morning coffee service. 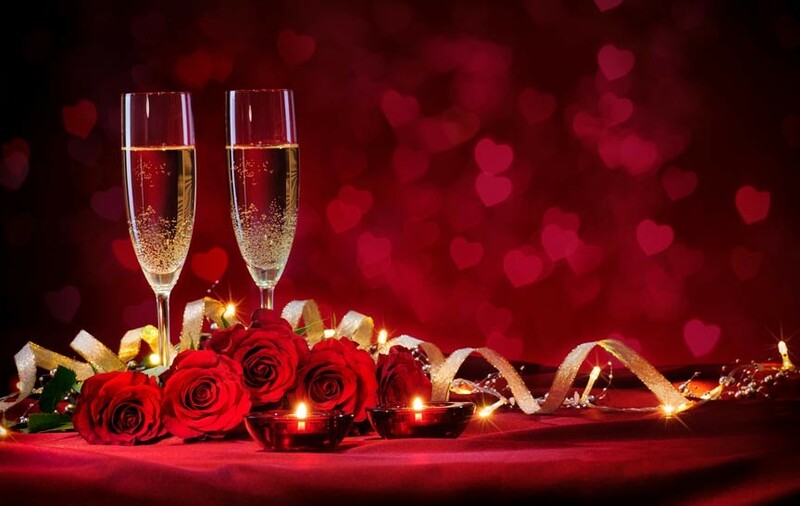 Our Valentine’s Day lodging package also includes The Ultimate Getaway Champagne Dinner For Two. This dinner at our award-winning restaurant is the centerpiece of our romantic lodging package. Your meal includes a bottle of Sparkling Wine, a selection from our appetizer list to share, and two specially prepared entrées. Top it all off with a choice of dessert for each of you from our dessert tray. Tres bon! After a night ensconced in one of our elegant rooms you’ll awaken refreshed and ready to enjoy breakfast! English Inn serves full, delicious breakfasts on weekends and fresh continental breakfasts throughout the week. We also offer romantic add-ons that will be found waiting in your room upon arrival. Our Sweetheart Surprise includes an assortment of cheese and accompaniments, along with a chilled bottle of Tosti Asti and two flutes. Our Wine and Chocolate add-on includes a bottle of Belleruche Grenache Syrah blend and four Ferrero Rocher hazelnut chocolates. Decadent, delicious, romantic! English Inn’s romantic Michigan lodging packages are designed to help to make your Valentine’s Day getaway the very best it can be – but they won’t be available forever! Book your room now, before we fill up!